The UFO hunter likened the supposed alien spacecraft to a Borg Cube from the Science Fiction franchise Star Trek. Mr Waring, who runs the UFO investigation website UFOSightingsDaily.com, came across the alien cube in a photo snapped by NASA’s Solar and Heliospheric Observatory (SOHO) spacecraft. He said: “The cube as you see, has something coming out of it – there is an opening. “It looks like there is a dark opening and there is some whitish material around it. “There is more white material here and this white object has a little trail coming out in this direction like it was coming out of this doorway. “So it does look like the cube opened up the doorway and something came out. Mr Waring’s photos appear to show a large pixelated square mass near the burning star at the centre of the solar system. A number of smaller objects are trailing away from the larger cube which the conspiracist thinks could be smaller vessels or spacecraft. There also appears to be a wide opening in the cube’s side – a bay door or portal of some sorts. The UFO hunter drew comparisons between the cube and the Borg spacecraft due to their uncanny resemblance. READ MORE: Aliens on Mars: Is this NASA photo of ‘alien statue’ evidence of UFOs on Mars? In Star Trek, the alien cyborg race known as the Borgs travelled through space in giant cubes without any discernible features on the outside. The alien cube found by Mr Waring appears to follow a similar principle. Some of the people who saw Mr Waring’s latest finding were amazed by the concept of a spacecraft this bizarre barrelling through space. There were, however, some YouTubers who questioned the validity of the photographs. 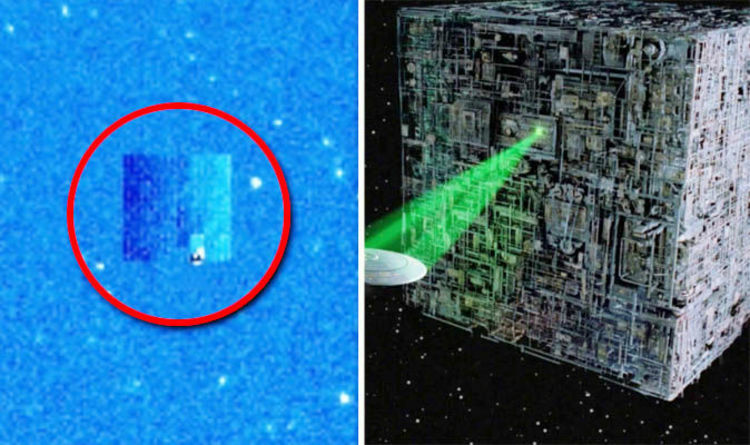 Some people suggested the alien cube was simply a digital glitch in the NASA photo and others even more bizarrely suggested the space agency was attempting to hide something from sight. NASA’s SOHO spacecraft is a real-time observation platform, designed to capture snapshots of the Sun for more accurate space weather predictions.